...that I am cheating on it. 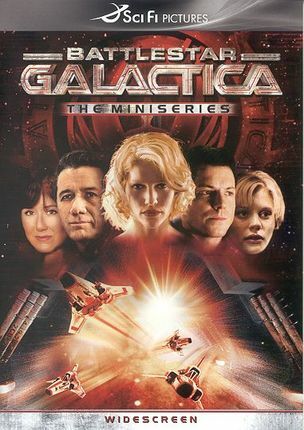 Yes, I must confess that I am cheating on my TiVo: I joined NetFlix, so that I could catch up on Battlestar Galactica. Okay, so I could watch three whole seasons of the show on DVD, which my TiVo would not allow me to do, because the show is no longer being broadcast. Some nerve. 1. The sets: this happens in the future, when humanity is on the run in the far reaches of outer space from Cylons, robots they created who want to destroy every living human being. They are in space ships that can travel faster than the speed of light, or something-ish, and "jump" into hyperspace. But meanwhile--and this is the part I love--the machines are oily, and full of gears and rust and ancient-looking metal parts. The ship sort of resembles a World War II era battleship, only with neon, cool Art Deco-ish touches, and views of asteroids instead of the North Atlantic. 2. The inconsistencies: when they want to get rid of a bad guy, or of the dead, they seal off a hatch and open a port door, and the bodies are sucked into the vacuum of space. But, sometimes, there's a big hole in the outer shell of the ship, and people in space suits explore the bomb damage, somehow NOT getting instantly morphed into space jelly. Why? Who knows? And those Cylon humanoids just appear on the ship, infiltrating the ranks of the real people--but how do they actually get on board? Again, who knows? And how did ace pilot, Kara (Starbuck) Thrace, manage to write her entire nickname in what appeared to be masking tape on the underside of her stolen space ship, when she had already run out of oxygen? And the vehicle was flat on the ground? Again, again, who knows? And I don't care, either! 3. The cast: Mary McDonnell is sublime as the new President of the republic. She was 32nd in line for the presidency, see, but was the only one in the government not nuked by the evil Cylons. I'd vote for her this fall, if I could. She's way more sympathetic than Hillary, though maybe not as savvy about foreign affairs. But, hey, she doesn't have to be. There aren't any foreigners any more! Also, in the middle of all this tsouris (trouble), what with the possible end of humanity and the running for their lives in the vast reaches of space, she's got cancer. 4. The underlying themes: what does it mean to be human? Are robots who talk and think and feel just like we do any less human because they are artificial? What does it mean to have a truly democratic government, even when facing complete extinction? Who has rights and who doesn't? 5. The fights: the pilots fly Vipers into space, but they fly around just like planes above earth, swooping and zooming and firing lasery-type bombs and bullets that look pretty against the blackness of the void. I have no idea if this is scientifically feasible, and I wonder every time I see it, but it looks really cool. 6. The cheekbones: every so often, several of the handsome youngsters on the show play a scene in which their high cheekbones, perfect skin, and glowing vitality are almost too much to bear watching. It's funny how these survivors of a future apocalypse are so attractive. It's the Rule of Television Darwinianism: The Survival of the Prettiest. My TiVo presented me with Aeon Flux this week, a sci-fi thriller starring Charlize Theron as a future-y ninja lady/deadly assassin/clone. The plot doesn't quite hold together, but the visual effects and ideas about the year 2415 are stunning. Everything is future-y and cool: the clothing is mono-kini-ish and exotic; the glasses pour clear liquid that turns fizzy and yellow, then dark; the grass and trees and fruit becoming killing weapons; and a Gal Friday type-ninja lady has her feet modified to become hands. Also, Charlize gets an imprint on her arm that's a map; her ear rings when someone wants to speak to her, I mean her actual ear lights up and rings like a phone, and then she processes the voice in her head; she gets a message she has to drink; and there'sa giant flying jellyfish that flies over Bregna, which is the last city on Earth. Everything has the look of a sleek, knowable future -- though the future will always be unknowable, so our guesses are only as good as the present can make them. Frances McDormand (Boomer, born 1957) shows up as a remote Boss Lady, who appears only as an ESP-type message in the brain: she's got pulsating red hair, for some reason. My standards have apparently gone way, way down this summer. Okay, the movie is silly--but I just love this kind of future-y stuff, parts of the world to come that I will never get to see. Big Love's final episode, "Oh, Pioneers," this week. Creepy as ever, of course, with Nicki getting all the best lines. Like this one, when Margene announces that she really does want to become a surrogate mother for a neighbor, in front of Ana, the waitress who'd been wooed by Bill, who's already got three wives. Nicki: "This is certainly not a matter to be discussing between a wife and a wife and a wife and a new friend, especially with family visiting. . . Our husband will have strong feelings about this matter." Later, to chastize Margene's growing sense of empowerment, Nicki scolds her again. Nicki: "You're the youngest and the shiniest and the newest, and arguably, somewhat attractive. You don't get to have those things and have more power over us." Chloe Sevigny delivers these delicious lines with her eyes squinched up in suspicion, her lips pursed, her mouth in a gnarly scowl. She's perfect. The lynchpin of the show, though, is Bill Henrickson, he of the three wives, played by Bill Paxton, a very well-aged Boomer (born in 1955). The problem, though, is that he has become so venal, so morally corrupt and greedy and vindictive, that it's getting more and more difficult to sympathize with his bizarre polygamous plight. He's also fairly blind to the many ways in which his life is falling apart all around him. In this Season Finale, for instance, his precious 17-year-old daughter has given up her virginity to her scrawny, 26-year-old boyfriend; Alby Grant has engineered the arrest of his father, Roman, after the Plan to Poison the Patriarch failed; his demented mother, Lois, is trying to persuade the even nuttier sister-in-law, Wanda, to poison Roman with anti-freeze; and his first wife, Barb, is onto his wooing of a potential fourth wife. BIll's creepiness grows with each episode: still, I can't turn away. In a TiVo slump now, since television programming seems to have shut down on and around Memorial Day weekend. That's my only excuse for not only TiVo-ing, but actually watching the Hallmark channel's three-hour torture-fest, Pandemic. This show was so terrible, that I feel as if I've been poisoned, and my whole system needs to be flushed out. Or, maybe, it actually gave me the flu--ARGH! I've been infected by the Really-Bad-Television-Virus!! Rarely have I seen a show in which the acting is bad, the script is worse, the direction is even more disastrous, and the whole thing makes no sense at all. Who knew Hallmark even had its own channel? Maybe it's a diabolical corporate plot: the shows here are so terrible, that it makes their cards look like masterpieces of creative genius! And poor Faye Dunaway, a pre-Boomer, born in 1941, has lifted, and Botoxed, and siliconed her face so much that the only part that can still move is her eyelashes. Her injected lips look so heavy, I was afraid that they might just fall off her face from the sheer weight of gravity. The only value in a show like this is to make me realize that so much of it used to be this bad, and how so much of it is now so much better. But, really, yech. Don't bother. Most people might think that the lovely "Fast Forward" button (which works in three different speeds, by the way), is useful only for zapping through commercials. But those people would be WRONG. Of course I use that button to rid myself of unsightly commercials, but I also use it to rid myself of listening to unsightly (unlistenable?) dialogue. When the script gets sappy, or stupid, or so predictable that I know what the characters will say before the words exit their mouths, then I simply use slow Fast Forward until I arrive at a less obvious and irritating scene. Now, one might assume that I shouldn't be watching any show that I need to fast forward while it's actually on, and one could be correct. But, still, I don't let a little bad dialogue stop me. Take this week's episode, "Bad News," of Brothers and Sisters, on ABC. There's trouble between Sarah, played by the wonderful Rachel Griffiths, and her husband, Joe, and they are having a heated argument in their kitchen. But it is such a predictable argument, and one that is so creepy--because he allegedly kissed his wife's hot little half-sister--that I simply had to skip it. Have TiVo, Will Skip! Done!! Several other scenes this week also proved to be Fast Forwardable, including one in which the Walker family matriarch, played by Sally Field, is acting way-too-flirty with a college professor who is sexually harrassing her into going on a date with him. The professor, played by Peter Coyote with a very high Yuck Factor (as in, He Is seriously disgusting), fails Nora Walker in his writing class, so that she'll have to go out with him on a date. I skipped the entire scene, stopping only to hear Sally Field say this: "I am such an idiot. You are a charming, intellectual louse!" Uh, yes, that would be correct. 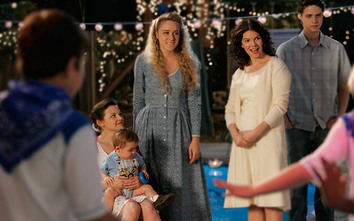 Other examples of essential, programmatic fast forwarding: at least once during every episode of Jericho, usually for inane, embarrassingly bad dialogue; at least once during every episode of Gilmore Girls, if Kirk or any other "quirky" character actors are onscreen; any time Meredith whines too long on Grey's Anatomy. Or any time the camera pulls back, and we hear muted violins, piano, or soft orchestral music. I'm hoarding the little bits of TiVo I've got to watch, in these in-between holiday days of no TiVo worth TiVo-ing. There's just a small TiVo trickle, at least until next week, when the new season finally begins again. It's as if the networks figure that we need 2 weeks to recover from New Year's. I tried Dirt, the new show with Courtney Cox on FX about a tabloid magazine editor. There are no Boomers in sight in this show: nobody born before 1965 need apply. But it lacks heart, at least so far. My favorite part is the depiction of the schizophrenic photographer's hallucinations, when his words take shape in the air in front of him, then turn into worms. It not only looks cool, but it gets across the odd terror and beauty of severe mental illness. Still, in my new spirit of setting a higher bar for Season Passing, I'm not sure that this show will make the cut. There was also a new episode of Friday Night Lights, which is really growing on me. The overlapping dialogue between the husband and wife, testy and affectionate all at once, is among the most realistic of any I've seen on network television. The high school kids, too, are charming and not ridiculously clever and insightful the way they are in lesser shows. This show is a keeper, and is definitely a Season Pass, despite the fact that there isn't a Boomer anywhere, not among the parents or the high school administration or the football coaching staff. Connie Britton, who plays the coach's wife, was born in 1968. And the network website seems to feature only the kids on the show and none of the parents. Granted the youngsters are prettier; they're just not us. This is not to say I've stopped reading. I just finished The Uses of Enchantment, by Heidi Julavits. It's one of the most complicated, most complex, most dense books I've ever read; just trying to figure it out, on so many levels, hurt my head. I can't imagine trying to write such a thing. It's all about psychotherapy and lying and betrayal and withcraft and imagination. Reading a book this well-written and challenging and thoughtful is thrilling and discouraging all at once. I love the pleasure of diving into a book like this; but I despair at ever ever ever being able to write so well. One more TiVo--this one a guilty pleasure: Ugly Betty. This episode was an odd kind of flashback, and my TiVo expunged the first minute of the broadcast, which it seems to be doing on a regular basis now. The effect was like watching a past episode that I had missed, somehow. Still, Betty is sweet and funny and the show snags me from the start and won't let go. This year, I vow not to watch TiVo for TiVo's sake: no more sneaky viewings of third-rate movies, just because my To Do List has been depleted. Thus, no more hopeful showings of The Machinist or It's All About Love or any other movies that I'd never heard of, for good reason. Some movies should be forgotten, and never viewed in any form, on video or DVD or Pay Per View or TiVo. Another resolution, not TiVo-related, is that I will get the hang of blogging, and remember that it's not a private diary. Because I get paid to write, I feel weird writing this stuff for free, unless it's for my eyes only. And it felt that way until a few days ago, when I received an email from somebody who'd read one of my posts. I felt, ridiculously, shocked and slightly horrified that somebody I Don't Know was looking at this stuff. Actually, it was kind of creepy. Here's another TiVo Year's Resolution: I will not get a Season Pass to shows I don't really like. Case in Point: Six Degrees, which I persisted in watching, although I never really enjoyed it. The thing is, I just assumed that at some point it would improve drastically, and at that point, I'd be really glad I was already watching. Never happened. Also, there were seriously no Boomers in that show--nobody who looked like me or any of my friends. Voila--deleted! How's this? I will try to limit my TiVo viewing to, uh, let's see, two hours a day? Hmm, what with 24 and Rome and Prison Break starting again, that may be difficult. Oh, the hell with it. I Love My TiVo, so why should I deprive myself?? I am extremely distressed about the damn Ides of March, what with the lovely Caesar dead and gone. Now that was one Primo Boomer. Wait, I have another TiVo Resolution. I won't watch or TiVo American Idol. And I won't even deign to give it a link, so there!! You've seen one season of Idol, you've seen them all. This fledgling enterprise is dedicated to TiVo, my devotion to which is virtually unlimited, as my family and friends have been pointing out for quite some time now. I used to be the kind of person--and mother--who looked down on people who watched a lot of television. I was a reader; I exercised; I went to the movies. I didn't need to watch television. Then, the oddest thing happened. Television got better, much better; it became worth watching. During the past few years, movies have gotten worse and television shows have gotten better. (Either that or my judgment has seriously deteriorated. But I don't want to think about that.) In my peak Boomer years, I'm allowing myself to do whatever the hell it is I want to do. Anyway, as a result, I have to defend myself against a mounting tide of criticism about my loyalty to TiVo and my ever-growing amount of TiVo homework, which seems to pile up relentlessly, week after week. The problem is this: I really want to watch all this stuff. Also, now that my children have gone away to college, I have the TIME to watch this stuff. Plus, I have a television on which to watch it. My love of TiVo is also based on the beauty of TiVo technology. If you have a DVR, you do not--I repeat DO NOT--have TiVo. Instead, you have an offbrand and way inferior machine that only vaguely resembles TiVo. In my opinion, anything other than TiVo is, by definition, inferior. It’s like saying you own a Jeep, when you’ve got one of those hideously ugly Honda Elements, that might seem vaguely Jeep-like in shape to the mildly myopic. Or it's like claiming you've got Kleenex, when what you actually have is a ragged, leftover hunk of toilet paper. If your box doesn't say TiVo, it's not a TiVo. If the screen doesn't say TiVo, it's not a TiVo. Go out and get the real thing.